Adductor magnus is said to be the largest muscle present in the medial part of the thigh. 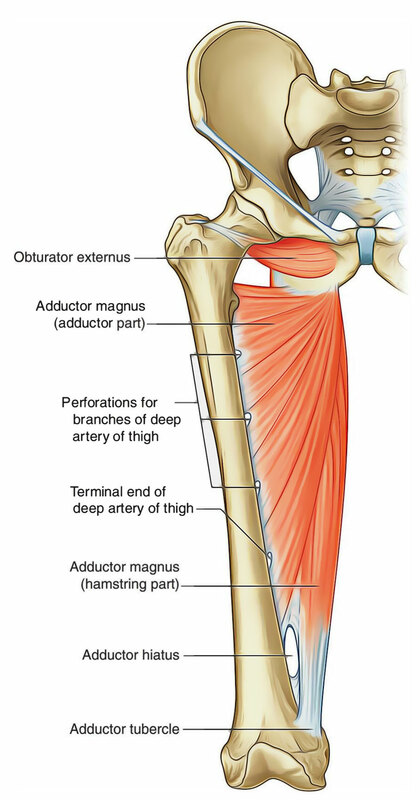 Adductor magnus is a big composite muscle having 2 parts: adductor and hamstring. Just like the adductor longus and brevis muscles adductor magnus is also fan shaped muscle attached to the femur. The adductor part of adductor magnus originates from the outer surface of ischiopubic ramus, primarily from ramus of ischium. The medial part of adductor magnus which is often known as hamstring part originates from the inferolateral part of the ischial tuberosity of the pelvic bone. The fibres of adductor part of adductor magnus pass obliquely downward, backward, and laterally to be added in linear style into the medial margin of gluteal tuberosity, medial lip of linea aspera, and upper part of medial supracondylar line up to the adductor hiatus. The fibres of the hamstring part pass vertically downward to be added into the adductor tubercle by a rounded tendon, which sends a fibrous growth to the lower part of medial supracondylar line below the hiatus. Adductor part by the posterior section of the obturator nerve. Hamstring part by the tibial part of the sciatic nerve. Adduction and medial rotation of the thigh in the hip joint. Hamstring part is a feeble extensor of the thigh in the hip joint. How many muscles combine to form adductor magnus muscle? Adductor part of Adductor magnus muscle is supplied by whichh nerve? Posterior section of Obturator nerve. Tibial part of Sciatic nerve. Anterior section of obturator nerve. Which muscle performs the adduction and medial rotation of the thigh in the hip joint.